This is all pretty cool and, from my point of view, the way to go once you want to use the reports in production and/or have several people working on/with the same reports. But lets go a step further. After some time, as your data model grows, you realize that the reports get slow and also the processing takes a considerable amount of time to finish. The official upgrade path will then guide you to Azure Analysis Services and you will migrate your data model to deal with the larger data volumes and make use of the flexibility in processing you gained by your upgrade. This migration process is very well described here. As you can imagine, rebuilding all reports was not really an option. The next option, the PowerBI REST API looked pretty promising at first sight. It allows you to retrieve and set the dataset that is used by your report. So the idea is to simply create a new dataset which points to Azure Analysis Services in Live Query mode, take the existing report and use the Rebind API call to bind it to the new AAS dataset. Even though this is supposed to work, I could not make it work in my environment. I tried all things that I could think of but nothing work and I also gave up on this. (If your file contains a data model, you see a file called “DataModelSchema” instead of “Connections”. The next steps will not work in this case!). However, in our case, as the report is linked to a dataset hosted in the PowerBI service, our file does not contain any data itself but only the connection information to our data source. As you can guess, this information is stored in the “Connections” file. To see what a connection to an Azure Analysis Services dataset looks like, I simply created a new PowerBI desktop model and established a Live Connection. Saved it and opened it again as zip file. The Connection file itself is just a JSON but the details are not really relevant here. I simply replaced the Connections file from my original report with the one from my new workbook linked to AAS. Renamed it back to pbix, opened it and voilà, my report was connected to AAS! This saved us a lot of time and we could move all of our reports within a couple of hours! Please keep in mind, that this is not officially supported and might break your model. 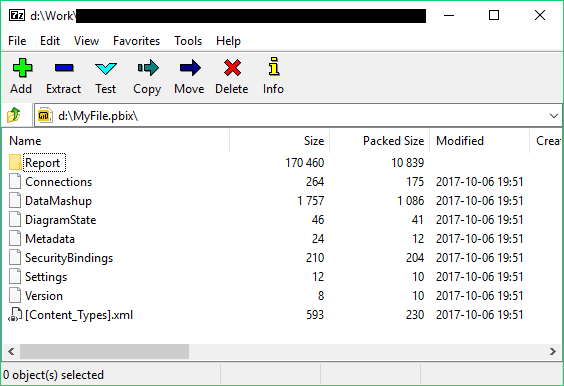 So make sure to always create a backup before you modify the contents of a pbix file manually! I do not take any responsibility for any broken models or anything else that might happen!